Releasing in April and July respectively this set is going to give us a proper look at what happens when a plane is subjugated by Nicol Bolas. In terms of things I’ve wanted in magic this gives me hopes for a new Bolas for my Sedris EDH deck and, more importantly, it’s an Egyptian mythology themed block – And I do love me some Egyptain gods. I’m concerned we’re dipping a bit far into Yugioh territory though, what with Eldritch Moon giving us Tribute and Fusion summoning, Kaladesh giving us “Card games on motorcycles” and now Amonkhet giving us literal Egyptian God Cards. If the next planeswalker has inexplicably “Anime” hair I think Konami’s gonna sue somebody. This feels like a bit of a cop-out. “But Crazy!” I hear you shout. “You love Commander don’t you?”. The answer is yes, but when they release Anthology sets I feel it’s supposed to give players access to products they might not have otherwise been able to find. 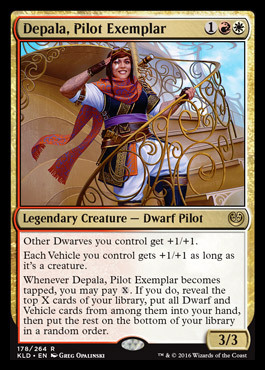 In this set we have one Commander deck from each series so far – Going back in order those in particular are Meren, Freyalise, Derevi and Kaalia. Now if I were to walk into one of my local game stores right now I could probably buy at least Meren and Freyalise with very little issue, maybe even Derevi if I shopped around a little – the point being these are all products that aren’t super difficult to find. The Kaalia deck on the other hand would not only take some finding but even if I could find one a sealed one recently sold for just over $400. For me this begs the question “Why not just reprint all of the original decks?” – They’re all hard to find AND ridiculously inflated price-wise due to some of the legacy staples they contain that have never been reprinted outside of judge promos like Flusterstorm and increase the supply of some other cards that sorely need a reprint like Oblivion Stone without breaking the market. All in all, a little disappointing I think. At least we get 4-colour commanders in a couple months. Now this here is one I’m very torn on. On the one hand Archenemy is one of the things that got me into the game in the first place via the Magic 2012 videogame and to see it come back with some new Scheme cards not only has a big nostalgia factor but also means I might even be able to get a game of it. On the other hand – No other new cards. Can’t help but feel there’s definitely some design space there like “If you are the archenemy” or more “You and your teammates gain” cards like Imperial Mask which would have been interesting to explore. Having said that if the entire deck is reprints that opens up room for some very interesting reprints – the legendary Damnation feels like it could be flavoured as a very Bolas boardwipe for example. We don’t know who the other face cards are on the other decks yet but since we know they’re all planeswalkers my money is on at least one Ajani. However, it does release in June, post-Amonkhet release – So we’ll see where the plot takes us. Now if this had been announced before I opened up a box of Conspiracy: Take the Crown I’d have been pretty excited to see this. But it didn’t, and now I can’t help but feel that an overpriced set of limited print-run boosters is just going to be thoroughly underwhelming by comparison. Focusing on the positives though – They have confirmed that Innistrad and Return to Ravnica will be included in this one – Meaning potential reprints of Modern favourites such as Liliana of the Veil, Snapcaster Mage and Abrupt Decay. Other cards that haven’t seen print in other Modern Masters sets but could here include the fetches and shocklands – Which might even make this worth getting excited about. Expect to see this hitting shelves around March next year. Admittedly, there’s not much to say about this because literally all I have to go on is the name – but there are some assumptions we can make. For one, with a release date of March 31st it will likely contain some cards from Amonkhet, much like how Blessed vs. Cursed contained the preview mythic Mindwrack Demon. One thing I am slightly concerned about is that this feels very similar in theme to Speed vs. Cunning (Zurgo Helmsmasher vs. Arcanis the Omnipotent) which isn’t necessarily a bad thing but if we keep getting different variants of Brains vs. Brawn (You can have that one for free Wizards) then it could get incredibly same-y. And that’s a wrap! As cynical as a lot of that sounded I think that we have a lot to look forward to early next year – let us not forget we’re also getting Aether Revolt in mid-January and with Kaladesh already shaping up to be one of the most fun sets in a while I’m going to cautiously say that Aether revolt could be just as fun. Now if you’ll excuse me I have go and build Boros Dwarf-Racers because it turns out Wizards can do something different with Red/White legendaries. The EDH banlist – Take the Power Back?